If you just can't get enough of that fine, mouth-watering bacon scent, now you can lather on this cool new Bacon Shaving Cream before you shave to smell like this tasty breakfast meat treat all morning long. 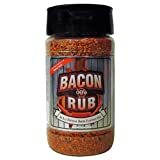 It features rich moisturizers, essential oils, and advanced heat-activated aromatic bacon-scent technology. Yep, bacon love has now officially jumped the shark... er, pig.